Ellisville Mayor Adam Paul is one of numerous municipal officials who are speaking out against a city-county merger. Now, Paul is at the center of another highly-charged debate. He helped Ellisville pass a resolution opposing a merger between the city of St. Louis and St. Louis County. Ballwin, Valley Park Green Park have passed similar measures, putting the towns on record against an idea that’s been floating around for decades. Paul acknowledges that the resolution is symbolic. But it showcases the angst some municipal leaders have over the increasing talk to end the so-called “Great Divorce” between the county and city. Municipal officials fear the end result of such discussions could be a plan that weakens – or downright eliminates – St. Louis County's municipalities. “The resolution that Ellisville has passed was nothing more than a resolution saying that our services and the level of services we provide to our residents are second to none, and that we’re going to oppose anything that is a detriment or has a negative effect to the services that we currently provide,” Paul said. Talks of a city-county reunion gained steam after the formation of Better Together in November, a group studying the two jurisdictions' finances, governmental administrations and economic development functions with an eye to weighing the viability of a merger. Officials connected to the group don’t understand the backlash, especially since a specific proposal is potentially years away from consideration. They say the study could provide residents with enough data to choose their own destinies. “We determined that let’s just get a lot of data together and have a community conversation,” she added. St. Louis is one of the few cities in the nation responsible for county functions, an arrangement that’s prompted decades of debate. Proponents of a city-county merger have argued that keeping the two jurisdictions separate is inefficient, and that ending the divide could lead to streamlined government, cost savings and a more enticing business climate. Those are the questions that Better Together's studies hope to resolve. The findings could eventually be used to formulate some sort of a reunification plan, although the group’s leaders have emphasized that they have no preconceived proposal. St. Louis City Hall (above) and St. Louis County's Administration Building. The formation of a group called Better Together has sparked a backlash among some municipal leaders. Since the group formed, some municipal leaders have been increasingly vocal about their wariness toward a merger. 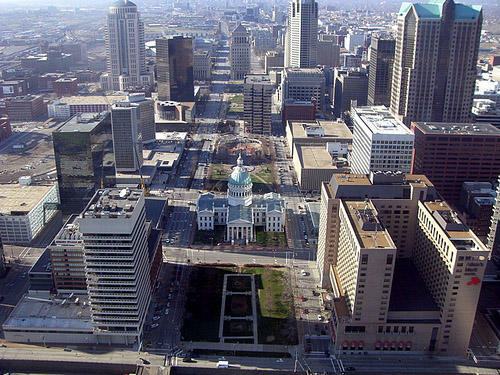 One of the biggest concerns they express involves whether the city would funnel off county resources – especially if the county takes over maintaining St. Louis’ roads or managing parks. Several municipal officials interviewed by St. Louis Public Radio also said they worry the end result of the Better Together study will be a proposal resembling Indianapolis’ “UniGov.” That involved blending the city of Indianapolis and a number of surrounding municipalities into one consolidated government. Then there are the political considerations: Any sort of merger proposal would almost certainly doom Republican efforts to win the county executive’s office or take over the St. Louis County Council because the city of St. Louis is heavily Democratic. Ballwin Alderman Shamed Dogan said that result could make it easier to pass tax increases. He also said it could lead to other unintended consequences. Ferguson Mayor James Knowles – who has worked for Republican candidates over the years – said the political impact of a merger is a source of consternation. He said it’s not just limited to Republicans who may lose political power. For his part, St. Louis Mayor Francis Slay isn’t terribly surprised that talk of a city-county merger sparked a backlash from municipal officials. St. Louis Mayor Francis Slay doesn't think much of the criticism from St. Louis County municipal officials. The opposition of municipal officials also doesn’t shock Jim Buford – a Better Together board member and the former head of St. Louis’ Urban League. It should be noted that some of the municipal officials speaking out against the city-county merger are running for higher offices. Ballwin Alderman Dogan is running as a Republican for a state representative seat. Ellisville's Mayor Paul and Ballwin Alderman Mark Harder are vying for a St. Louis Council Council position. Green Park Alderman Pousosa is running for county executive. But Paul says his opposition doesn’t have anything to do with his county council run.He said he started questioning the merger before he even knew the seat he is running for was up for grabs. He did, however, concede that the city-county merger is a “hot-button” issue among Republican voters. Not every municipality is following the lead of Ellisville, Ballwin, Valley Park or Green Park. Ferguson Mayor James Knowles supported his city's resolution to carry out Better Together's study. Knowles -- one of the few Republicans who hold elected office in north St. Louis County -- said the merger debate could be an opportunity to push for non-partisan elections in the city or county. Ferguson recently passed a resolution supportive of Better Together’s study. While Ferguson Mayor Knowles said he doesn’t necessarily “favor allowing the city of Ferguson to go away and become part of a massive, million-citizen bureaucracy,” he’s willing to give the group a chance. Knowles also said Republicans who are reflexively opposing the merger are missing an opportunity. The merger debate, he said, could be a chance to make city or county elected positions nonpartisan. That would give Republicans living in heavily Democratic areas a better chance of getting elected. Kirkwood Mayor Art McDonnell said the city-county merger is a “big topic, and it won’t get solved by a resolution.” But, like Glantz, he said cities need to pay attention. “As much as cities like to think that ‘I’m doing okay where I am; I don’t need to consider this merger,’ they still need to be aware, and think about it and get involved in how to get the region get better,” McDonnell said. Webster Groves Mayor Gerry Welch also said her city's council isn't likely to sound off on the city-county merger. She said "it is hard to take a position if you don't know anything about arrangements." But Welch isn't completely happy with how the discussion has gone. She doesn't like how some merger proponents have raised the specter of UniGov, adding that "we ought to be building on what we have and not modeling on something else." She also said the county's municipalities should have a more direct voice in Better Together's studies. "We represent the majority of people at the grassroots level in St. Louis County," Welch said. "But we're not at any table. When you don't get people at the table, then you don't get their cooperation. What you get is their suspicion." But Rice said her group has reached out to and met with “countless municipal officials” and “absorbed their comments and guidance into our process.” That includes meeting with the St. Louis County Municipal League and specifically inviting municipal officials to participate in the group’s process. In some ways, the opinion of municipal mayors and council members doesn't matter that much. As of right now, any merger proposal would have to be approved by city and county voters before going into effect. But one practical aspect of Ellisville and Ballwin’s resolutions is to send a specific message: If there’s going to be a proposal, it has to take municipal concerns into consideration. Dogan says that means two specific things: The first is taking any proposal similar to Indianapolis’ UniGov off the table. The other is not have the proposal go to a statewide vote. As of now, the Missouri Constitution stipulates that a merger would have to receive approval only from city and county voters. But there's a general consensus that it may be easier to pass a proposal statewide, which Dogan said would be "horribly misguided and incur a huge backlash." Rod Jetton was once the most powerful lawmaker in Missouri. As speaker of the Missouri House, he had the power to exalt or kill any bill that flowed through the General Assembly. From all appearances, he had a bright political future. Behind the scenes, however, Jetton was on a course for self-destruction. By the time he left office, the FBI was investigating him for bribery. He was facing serious jail time after being accused of felony assault. Just months after being one of the most powerful men in Missouri politics, Jetton was broke and without a job. Ellisville Mayor Adam Paul, who was at the center of a high-profile effort last year to oust him from office, is now seeking to be elected to a new job on the St. Louis County Council. Paul filed Monday afternoon for the 7th District seat that’s now open, since longtime incumbent Greg Quinn announced that he wasn’t seeking re-election this fall.